I’m not a native to the “real” South, so I was intrigued to learn about the custom of having collard greens and black-eyed peas as a mandatory part of New Year’s day dinner. 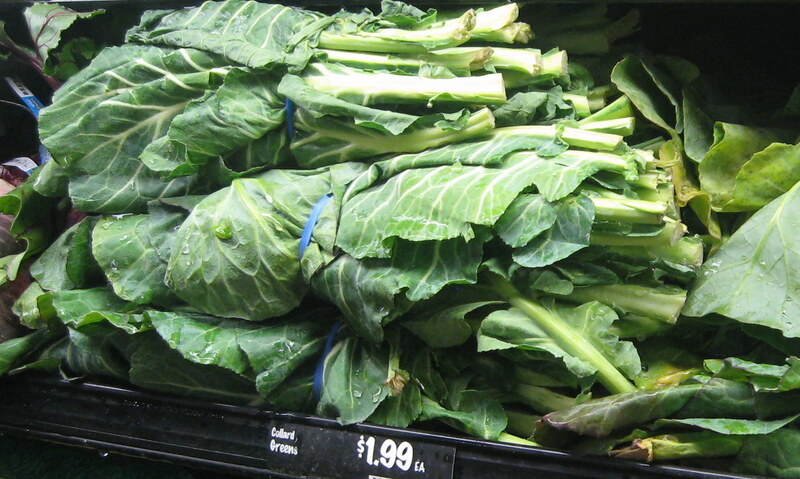 I like greens–so not big thing about the collard greens. I like pulses, legumes, and all those things too. Again, no big deal. Unfortunately, I may be a less finicky eater than some of my friends and acquaintances. On several occasions I’ve been the delegated to prepare those dishes for New Year’s day meals. So–dinner for eight or so, I prepare collard greens and black-eyed peas in a traditional Southern style–well, talk about leftovers–everyone had the mandatory dishes–about a teaspoon of each! Next year, I lucked out again–make collards and black-eyed peas. I made a much smaller quantity of each, but still had mega-leftovers. Enough of that! Next time I was delegated to bring collard greens and black-eyed peas to a New Year’s Day gathering, I decided that something had to be done to make those palatable to the kind of guests at the meal–true we’re all foodies, but some of us more than others. I decided that the problem was not collards and black-eyed peas per se, but rather that they just did not fit with lovely roast duck with a nice fruit sauce. I decided that I needed to present them differently. Personally, I’d happily make a one-dish casserole of the collard greens, some sausages, and the black-eyed peas–a variation on one of my favorite recipes from Jacques Pepin’s The Short-cut Cook. That still did not fit with New Year’s Day festivities. My next though was that all these people (in fact, most people I know) really like risotto. After perusing a number of recipes, it seemed that as long as you could add most anything to basic risotto, as long as you did the appropriate pre-cooking. I decided that it was time for collard greens and black-eyed peas to make a début as risotto ingredients. Thankfully, the frozen vegetable case at my local supermarket came to the rescue: frozen collard greens (chopped), and frozen black-eye peas! Happiness. I started the basic risotto recipe with onions, white wine, olive oil, and sautéed the rice. I used home-made chicken stock for the liquid. Frozen collard greens are already blanched, chopped, so all I did was to thaw them, give them a bit more in the way of a rough chop, and since they are rather “tough” greens, steam-sautéed them (without adding any more liquid) until close to being done. The black-eyed peas seemed a bit more problematic since I knew that those can turn to mush easily as they’re fragile; I cooked those separately until almost done (according to the directions on the package). When the risotto was close to being done, I added the collard greens and the black -eyed peas, and then finished the risotto with the Parmigano-Reggiano as usual. Taking into account my earlier “luck” with collards and black-eyed peas, I made less than I though eight or so people would eat. Wrong again–needed more–these foodies wanted seconds!